BEAT Esports is partnering with Antlion & Moonduck TV to gift one of their fans with a brand new wireless gaming microphone! 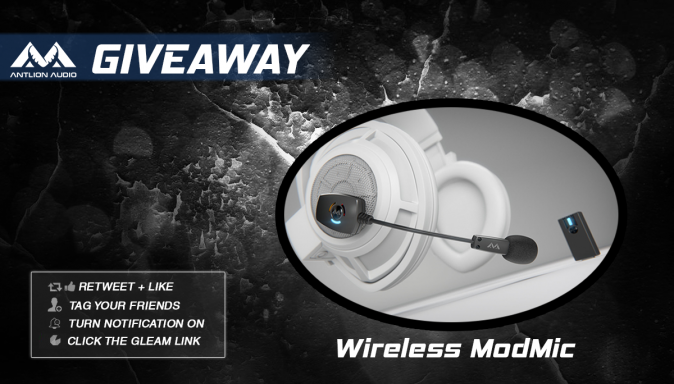 To enter in their latest Antlion Wireless ModMic Microphone Giveaway grab your free entries by following few simple steps listed down below! The ModMic Wireless by Antlion Audio is an attachable microphone for over-ear or on-ear headphones. You can turn your favorite headphones into a headset. The ModMic attaches with a magnet, remove the mic when you’re on the go or add a magnet to multiple headsets for an easy mic switch. The ModMic uses Qualcomm aptX Low Latency to deliver a sample rate that has 5X higher quality than a standard Bluetooth headset. With a latency of only 34ms, the lightning fast studio quality sound is ideal for competitive play and streaming. GIVEAWAY END: May 15th, 2019 at 11:59 EST.